If you’ve been in the security integrations business for a while, you probably have experience working with a lot of different camera manufacturers. You may even have a favorite IP camera brand or product type, something you’re familiar with and would even recommend to others to use. Why does it top your list? My guess is because it’s easy to use. After all, installing IP cameras can be time-consuming, especially if you’re working with a device that’s not exactly user-friendly. You can spend a lot of time playing with settings and trying to configure the right field of view. That’s why I recommend choosing cameras with features that simplify installation and setup, so you not only save time, but can get your customer’s video surveillance system up and running faster. With that goal in mind, here are five great IP camera features that can speed installation times and simplify the configuration process. Remote zoom/focus saves you from having to do an in-depth site survey with multiple calculations to get the right field of view. Instead of manually adjusting lenses (an awkward task if your camera is mounted on a pole or high ceiling) remote zoom/focus lets you to optimize your camera view remotely from a computer. This is especially convenient if you’re working alone, because you don’t have to make multiple trips up and down a ladder. 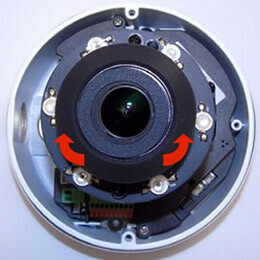 Similarly, auto back focus – a feature found in box cameras with detachable lenses – lets you adjust the camera’s back focal length automatically, without having to physically touch the camera lens. Again, this feature is extremely beneficial if you’re working by yourself, or if you’re installing multiple cameras in hard-to-reach places. 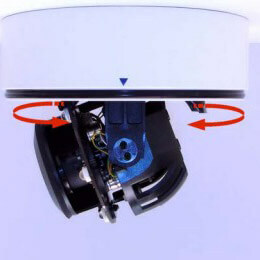 Most dome IP cameras let you adjust the field of view by moving the camera sensor two ways: right and left to adjust the pan angle; and up and down to adjust the tilt angle. But if your camera has a 3-axis gimbal, you can also rotate the sensor clockwise or counterclockwise, for additional flexibility. Because the camera’s pan, tilt and rotation are adjusted by a single mechanism, you can single-handedly position the camera during installation, making your job a lot easier. A 3-axis gimbal can really simplify setup, especially during wall/ceiling installations or if you’re mounting the camera on an irregularly-angled surface because it gives you a level perspective. For customers that require both video and audio, choosing a camera with a built-in microphone saves you time and hassle because you only have to install one device. You’ll deal with less wiring and more often than not, very easy configuration tools. You can find IP cameras with microphones for different applications, including indoor and outdoor surveillance, as well as mobile surveillance. March Networks’ new ME4 MicDome, for example, is outdoor rated so everything – including the mic – is packaged into a convenient IP66-rated enclosure to protect it from harsh temperatures and moisture. This is probably my favorite time-saving tool for IP camera installations: software that discovers your cameras on the network and lets you automatically add them to your recorder and provision them all at once. Instead of adding and configuring cameras one by one, the process is automated with a local mass management tool, which is a huge time saver for large installations. Some discovery tools – like the March Networks Discovery Browser – also let you upgrade the firmware on multiple cameras simultaneously, again saving you valuable time. If you work on large site installations involving multiple cameras, this is one tool you’ll certainly want to take advantage of. 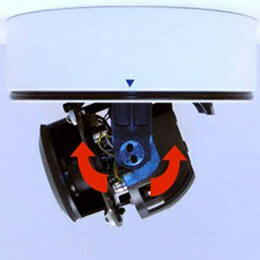 This isn’t a feature per se, but it is something to be mindful of when helping your customers select security cameras. Choosing IP cameras with good accessories and versatile mounting options gives you more flexibility during the installation process. Check to see if your preferred camera comes with a pole, wall or corner mount. Also, see if it ships with a back box to hide and protect cables from the elements. If it doesn’t, you may need to shop around to find suitable accessories or even order a custom mount. There’s a lot of great IP cameras on the market right now, and as technology evolves, I expect even more tools will be introduced to speed the installation process further. Stay tuned to this blog for more tips and advice on choosing surveillance cameras, and feel free to ask questions or share your favorite camera features in the comment section below.